These are a lot of fun to make, and the perfect addition to any backyard bonfire. This is a recipe that I got from Seattle’s own Not Without Salt. I love Ashley’s blog, and enjoyed the privilege of sampling many of her baked goods first-hand. I did a little tweaking on this recipe to match my own personal tastes. Feel free to do the same if you’re feeling adventurous! I chose vanilla extract instead of vanilla bean, and actually did some fairly extended research on the subject. Two of the most helpful articles came from Cook's Illustrated and Serious Eats. 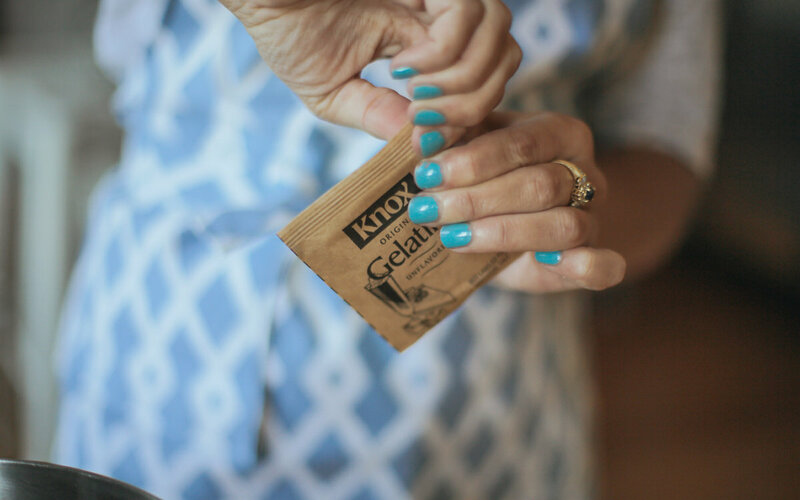 The former discussed the difference between real and imitation extract, and the latter compared extracts and vanilla beans. 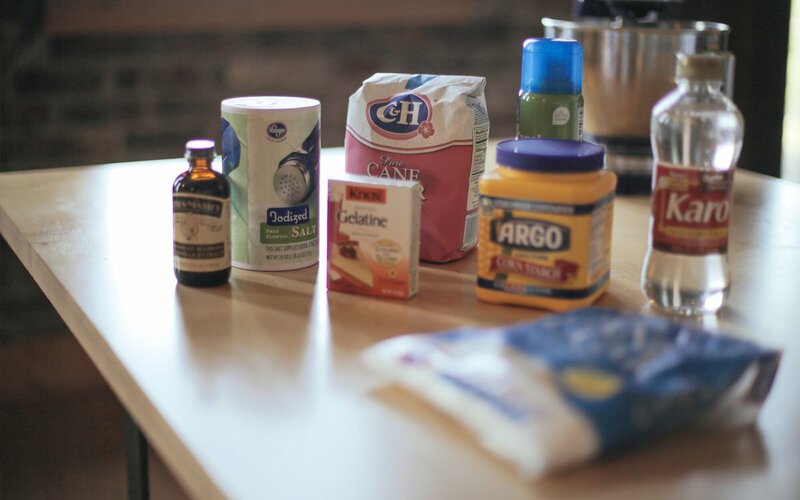 A difference wasn't detectable in the items that were baked—even between the imitation extract and the actual bean. (The process of heat apparently removes a lot of the subtleties of the vanilla flavor.) What was most surprising though, was that in uncooked taste tests (e.g. eggnog, ice cream, or crème brûlée where the vanilla is added after cooking) the distinctive winner was the pure vanilla extract. 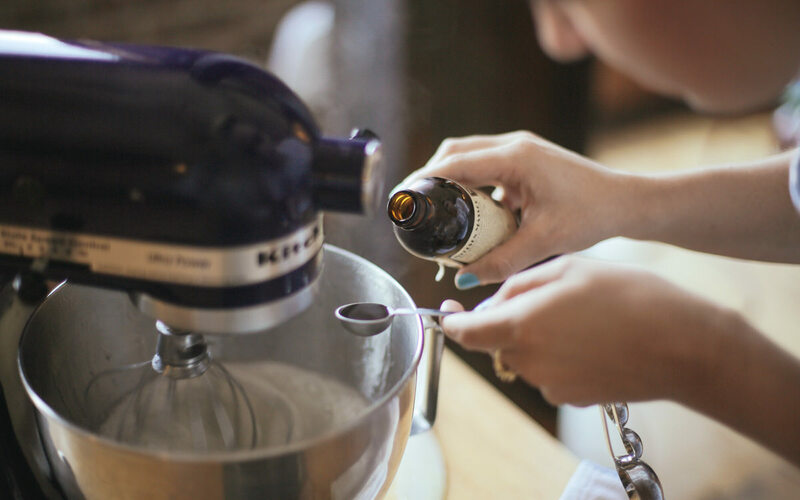 Vanilla extract is made with 35% alcohol, and after so many years of tasting extract in our recipes, it seems odd to us if vanilla doesn’t have that “boozy” quality to it. It registers in our minds as fake. So by adding a little vodka, your imitation vanilla can taste just like the real thing. My personal conclusion from this research was that vanilla beans are not worth the time and money, but in certain recipes, pure vanilla extract is worth both. 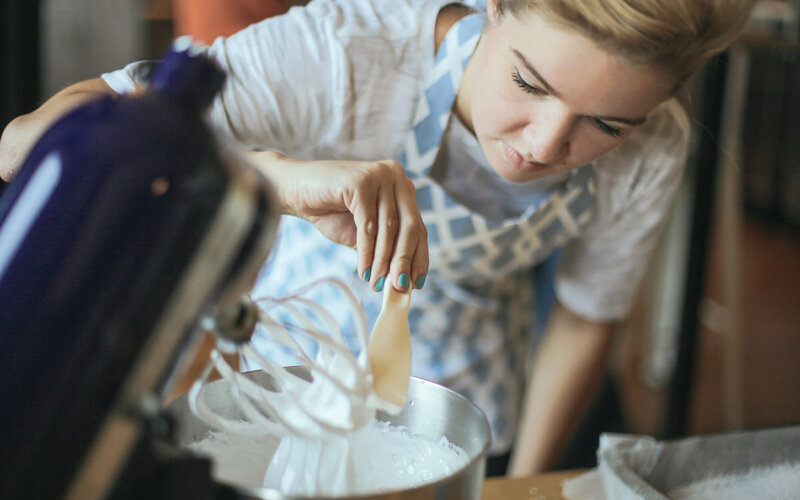 After you’ve set out all your ingredients, place the whisk attachment on your electric mixer. 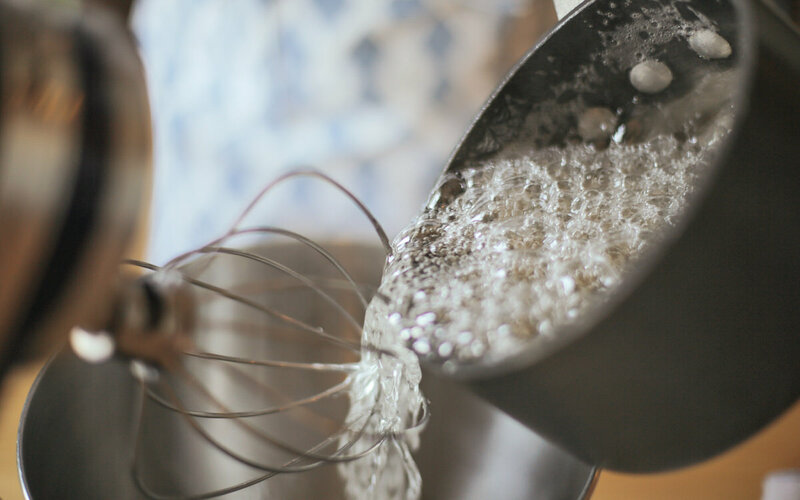 Mix the gelatin packets with ½ cup of water in the mixer, and let sit. 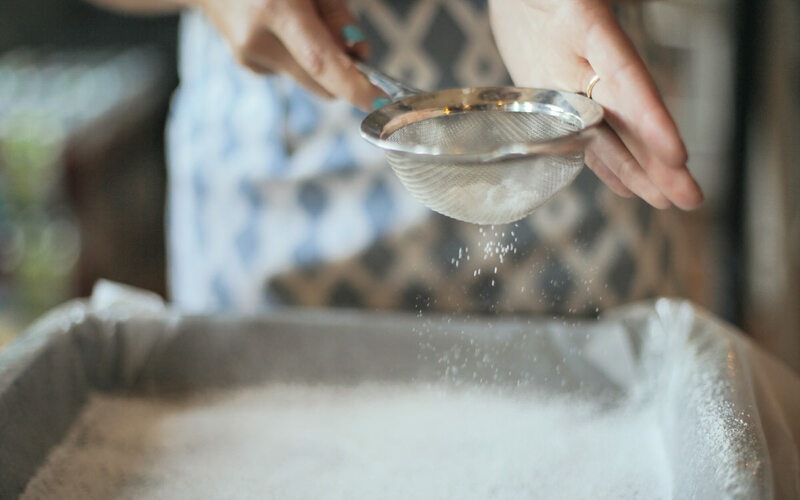 Combine ½ a cup of water in a small saucepan with granulated sugar, corn syrup, and salt. 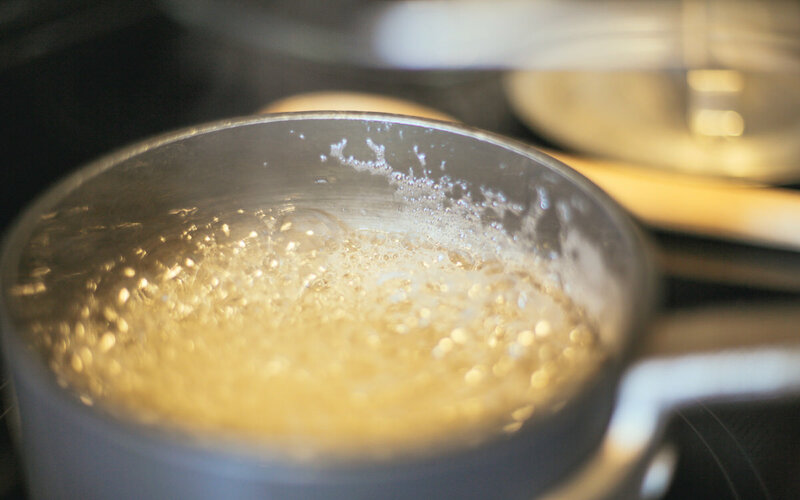 Place a lid on the pan, and heat on medium high for three to four minutes. When the timer goes off, remove the lid and clip a candy thermometer to the side of the pan. Heat the sugar mixture to 240°. This should take seven to eight minutes. 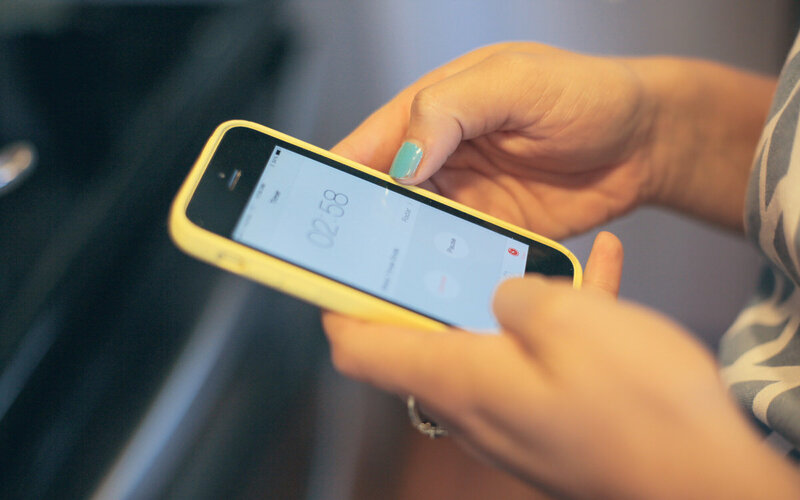 Immediately remove from heat when it reaches the correct temperature. Disclaimer: You'll notice a meat thermometer in the photos. 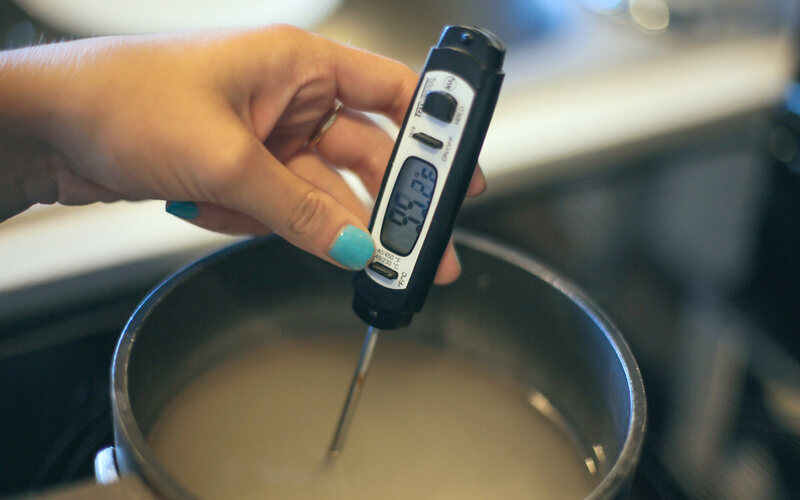 We strongly recommend a candy thermometer, but we just could not locate ours! The meat thermometer was an okay substitute, but it certainly made things a little more difficult. With the electric mixer on low, slowly add the sugar mixture to the gelatin. When you have added all the sugar, increase the speed to high. Now beat in the vanilla extract. Continue to whip until the mixture becomes lukewarm, very thick, and white. I love watching this transformation from the clear, gooey mixture to the snowy white fluff of the marshmallows. It’s like magic! 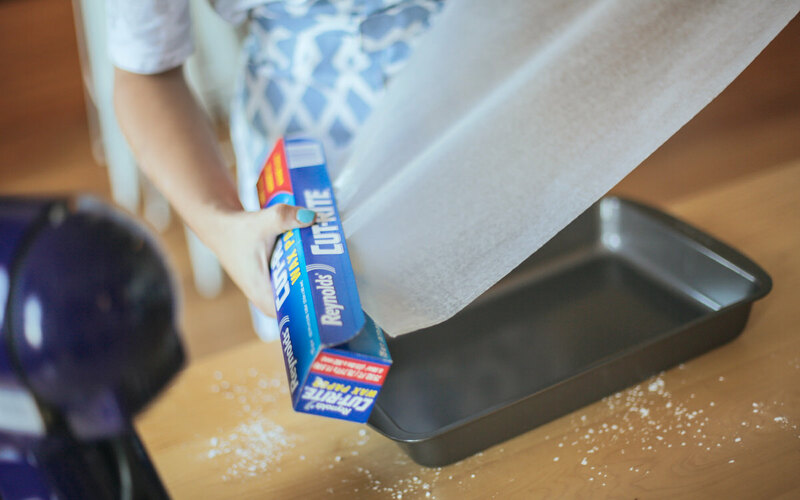 You can prep the pan while the marshmallows are being whipped. 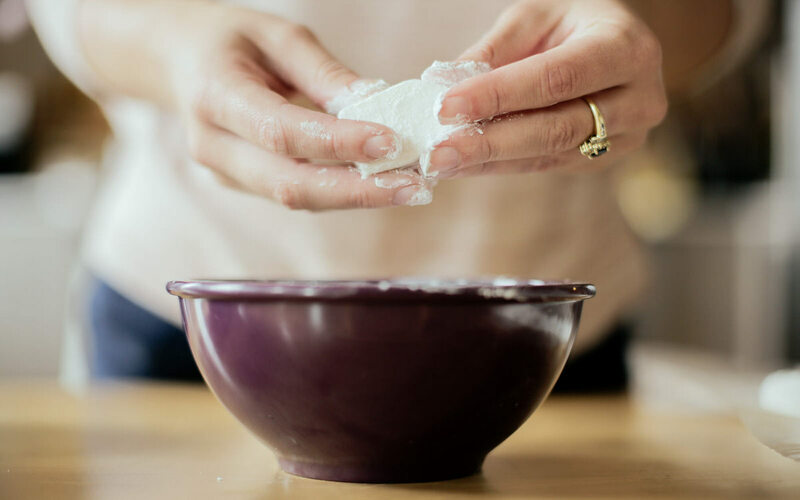 In a small bowl, combine a ¼ cup of cornstarch and a ¼ cup of powdered sugar. Line a 9" x 13" pan with waxed paper. 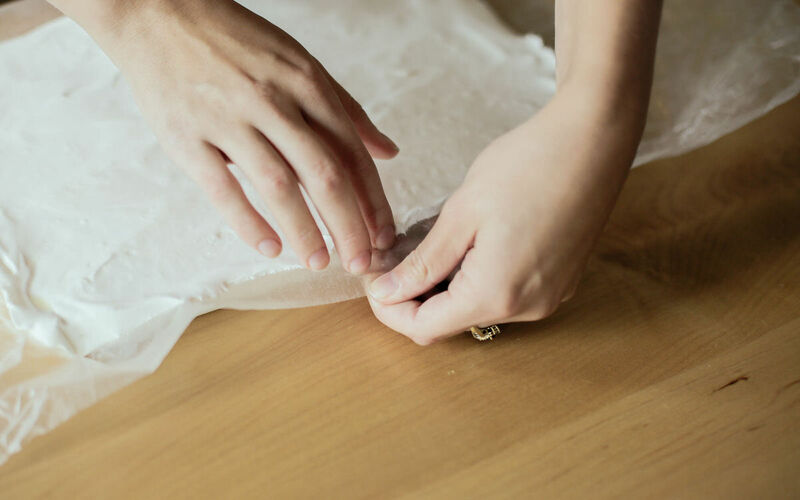 Spray the paper with cooking spray, and dust with the cornstarch and sugar. Carefully shake out any extra. Pour the marshmallow mixture into the pan using a lightly oiled spatula to remove the mixture from the bowl. Spread it evenly. 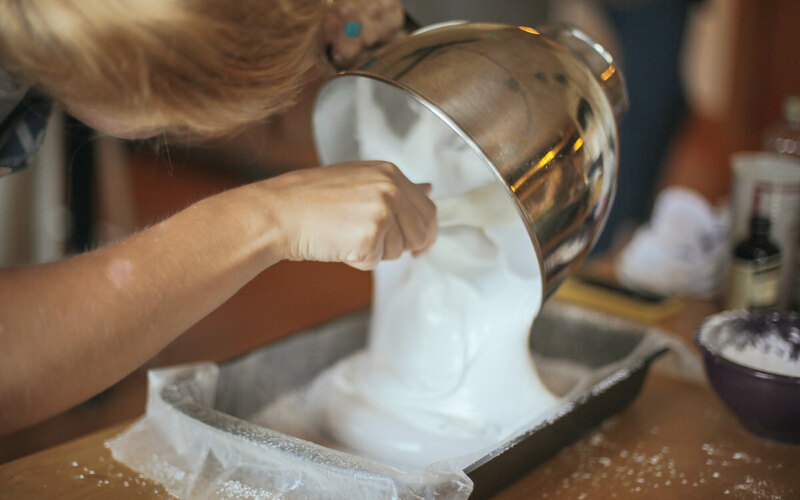 Now dust the top of the marshmallows with the cornstarch and let sit uncovered for at least four hours (or as long as overnight). 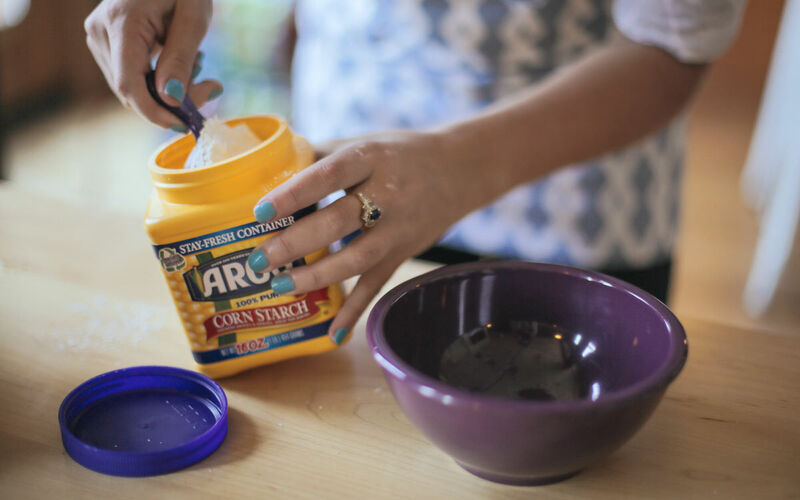 Set aside the cornstarch mixture as well; you’ll need this later. 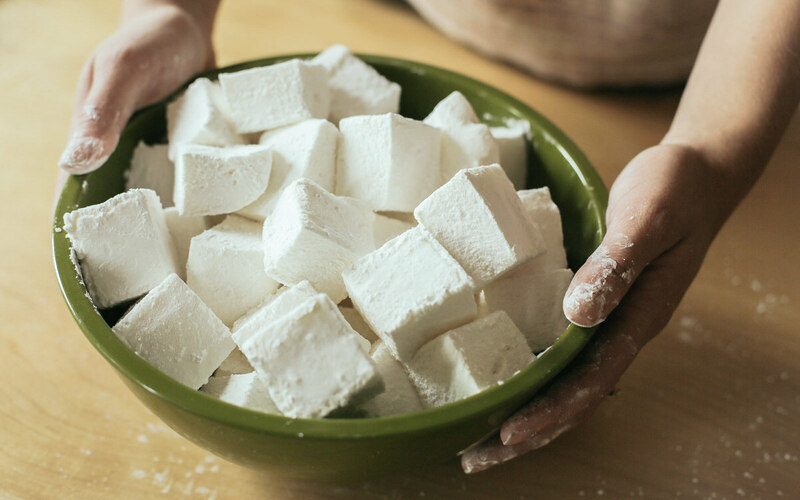 Once the marshmallows have set, turn them out of the pan and cut into cubes with a pizza cutter or a sharp knife. 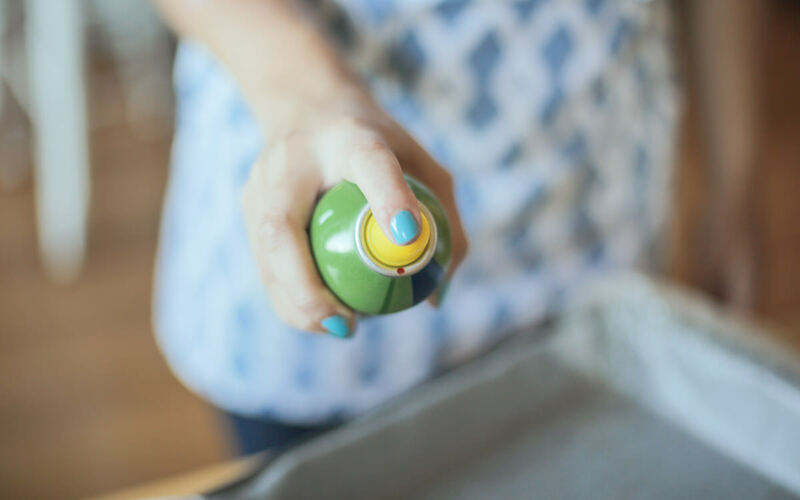 Oil the knife or dust with cornstarch to make cutting easier. 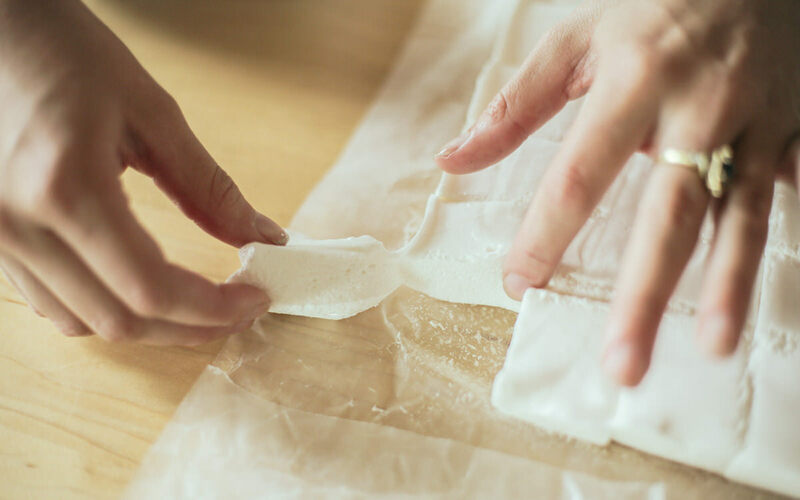 Pull the marshmallow squares apart and dust each individually in the cornstarch and sugar to remove stickiness. 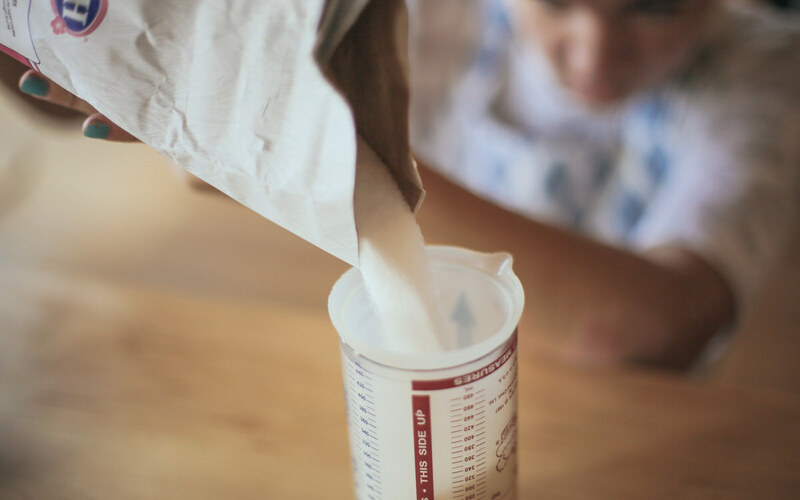 Store marshmallows in an airtight container or plastic bag for up to three weeks. Since I can’t eat all those marshmallows in just three weeks, I like to make Rice Krispie Treats with some of them. 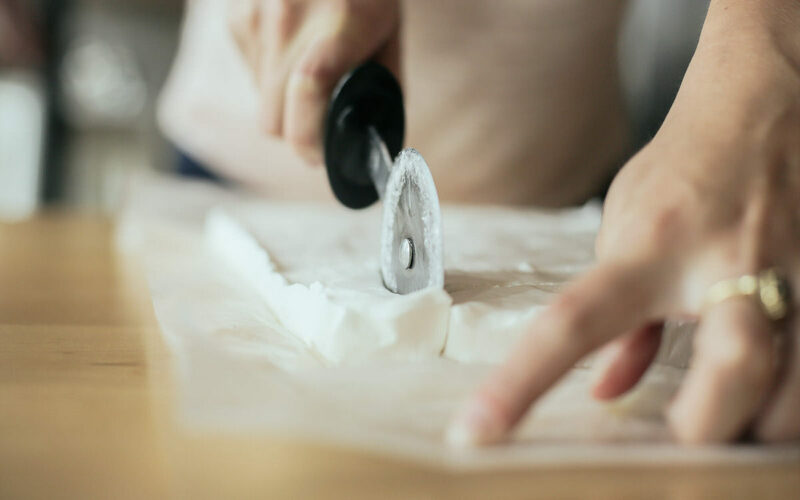 Adding some dried cranberries to the mix is a fun way to dress up this simple treat, and the homemade marshmallows definitely add a little something extra. Whatever you choose to do with your marshmallows—enjoy! Have a small kitchen or living room? NCIDQ-certified interior designer Keith Miller offers practical tips to help you get the most out of your living spaces. DIY Bench: A Birthday Bench! To celebrate our first birthday we have a great tutorial for you of this beautiful bench designed by Kirsten and Jacob. We really wanted to design something that was unique and beautiful and also solid. There’s nothing worse than building a wobbly bench!